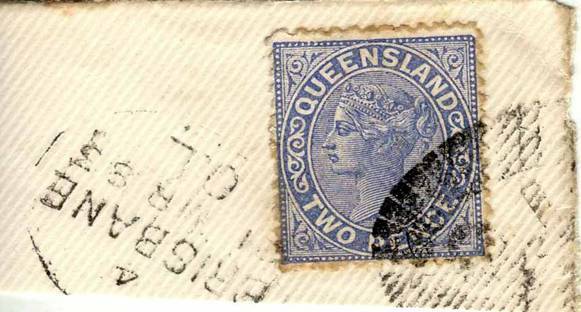 In a recent purchase [early 2006] I was able to pick out a previously unrecorded Brisbane cancel. It is 26 mm x 22 mm in the shape of an octagonal oval. There were three such cancels in the group of some 80 pieces [fig 1-3] each carries a different code number at the centre top, 4, 8 & 13. The first one I picked out with code number 8 was what I thought to be an unrecorded duplex [fig 1] as it was parallel with the obliterator an oval QL, but this turned out to be a listed Campbell type 6 with an unknown canceller. The second one I picked out had the code number 4 [fig 2] with the same QL obliterator, a Campbell type 6 this confirmed this new cancel was not a duplex at all but two separate strikes. Further conformation was given when I picked out the third cancel with code number 13 [fig 3] the QL obliterator was Campbell type 5. 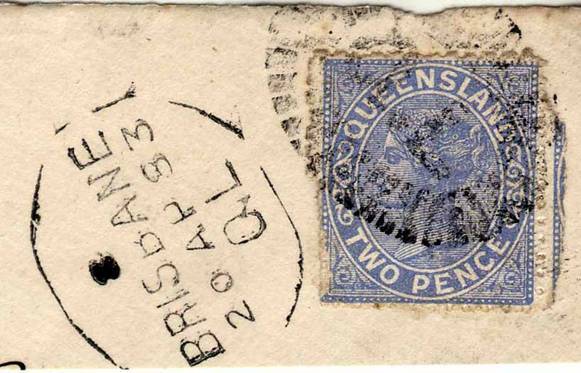 Campbell only records this as a single strike seen on only one cover dated 27 November 1877. So it is clearly rare. Fig 3 is clearly dated 23 April 1883 one wonders where has this obliterator been for the 6 years between the two dates. The period of use between the above three dates is only 34 days, any thoughts or additions members may have would be greatly appreciated. 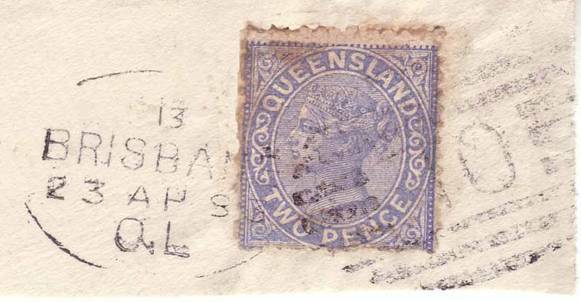 This unrecorded Brisbane cancel has been hiding for just over 120 years, is there any more out there? if you have copies please let me know so we can record further dates.